It is some 7 months since I last posted here. I'm sure I have said this before but time is flying by. What have I been doing. A lot is the answer. Since 8th January I stuck to my recovery expectation. My Consultant said based upon my positive attitude and drive, that I do not smoke, drink in moderation and infrequently, my exercise of gardening and fell walking preferably between 10 and 18 miles, he was confident I would be back to normal by 1st May 2017. That was my target, before the 1st May. When I saw him on 29th December 2016 to officially discharge me and commence the UK NHS 5 year cancer monitoring programme for me, by then I had done two weeks of minimal exercise followed with 4 weeks of moving about but not exerting myself, basically walking around the house. Certainly no fell walking or my serious DIY. From January I was told to start building my fitness back gradually. I started by doing 0.1 mile moving rapidly to 0.25 mile. I would do this 3 or 4 times a day for a week slowly increasing my distance. Where we live we have good land marks at varying miles so setting a target in this routine was quite easy knowing that I could as and when increase the mileage to the next land mark. All on tarmac roads and hard surfaces, I was not to go on rough ground or fell walk until at least May. By the beginning of March I was doing 14 miles on roads, including inclines at least 3 times a week and each day a minimum of 8. From early March averaging 60 to 70 miles a week was being recorded. No DIY was done, I simply read, attended meetings, my voluntary work but walked. Even our dog of 11 years with arthritis and stiffness in his legs, especially the back legs benefited greatly. If I went, he went. Prior to my operation we thought his days were numbered, struggling to sit down, doing a 12 miler once a week made no difference but by the end of March, sitting down and stairs were not a problem. He looked better! He is better with the exercising obviously easing the arthritis. On 29th March I saw the Consultant again. The first of 4 quarterly checks in year one, 6 monthly in year 2 and yearly in years 3 to 5. He was very pleased, more than pleased with my recovery saying he knows fit people who could not do 14 miles. I told him I am desperate for a proper fell walk and his reply was, do it, just back off the moment you feel anything not right, anything. On the 2nd April 2017, with a very good forecast of weather my wife and I set off to do Mount Snowdon in Wales, from home in one day! We drove there arriving at 9 am, had breakfast, started walking just before 10 am, completed 9.5 miles reaching the summit and Garnedd Ugain, returning back down around 4.30 pm. A pleasant drive to a lake with fine mountain scenery for a picnic and our journey back. Weather absolutely perfect, as to clarity. Wind none. On the top at over 3000ft (1085m). As far as I was concerned, it was business as usual. This photo is of me 4 months less 1 day after major surgery. My Consultant suggested I still stayed off my serious DIY for a while longer and my wife and I decided we would until November 2017 when the garden season closed. I was back gardening as in previous years, and since my wife retired, tending to 15 clients over 6 days in a 28 day period. In January 2017 I attended 2 meetings in connection with our National Trust Volunteering roles and their season started 12th February. Without looking back I am sure I have mentioned our volunteering roles at the National Trust in blogs last year. This year was different. The Hall had a few problems a few years ago and the new management were getting things moving again increasing the days open. in 2017 a new day for opening was to be and I put my name forward to be considered for Day Coordinator. This role coordinates the teams attendance for the day, making sure rooms were covered by volunteers and coordinating lunch covers for those there all day. With this being a new day we had no team but by the start of the season with a recruitment drive we had a team, gaining one or two more as the season went on. Four volunteers who had worked with me last year when we did two alternate days each week came and joined me. I attended the volunteer enquiry day in late January. As last year at the National Trust, and as I say frequently in these blogs, I was skirted and in clothing as seen in the photos on my web site. www.theskirtedman.co.uk I was skirted at the volunteer enquiry day and know one was forewarned - why should they - and I had no problems securing volunteers even though the drive was for a 4 days currently open! I gained the largest share of new volunteers from that event and by the end of March I can field when I have a full attendance of 9 in the morning and 9 in the afternoon. The man in a skirt, the same as women in male style clothing was not having any negative effect. The team are very supportive of me and extremely loyal to the team and proactive. Yes I have had about 5 visitors so far this year who have made it known to me of their disapproval but the vast majority interact with me with no issue. If a visitor asks about me to a team member they talk positively of me and why. The Halls visitor numbers are rapidly increasing over the last two years and so far this year 99% ahead of managements budget figures and before any readers think its due to me, a visitor attraction, it isn't, the numbers are up across the the 4 days and our day is consistently the 3rd best performing day out of the 4, not top and therefore not way above the other 3 days. 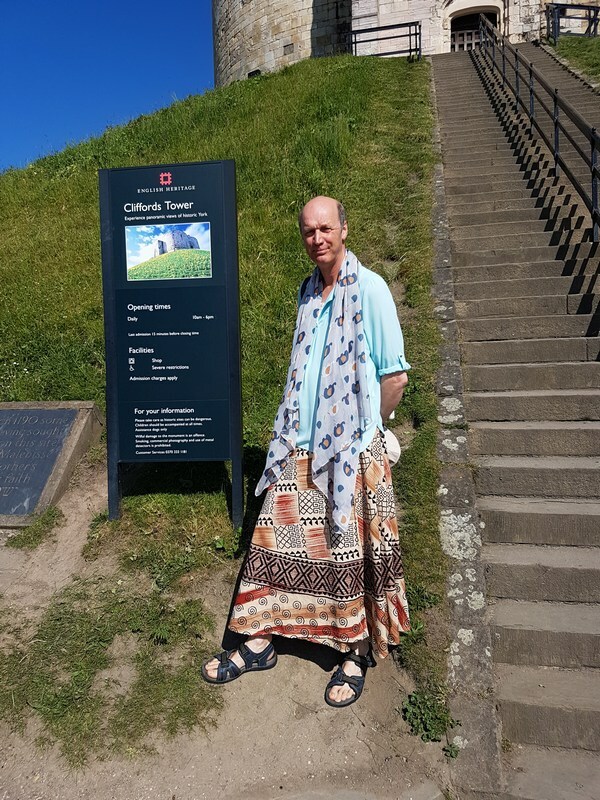 Therefore the sight of a man in a skirt does not move visitors and can indicate it is not an issue to the vast majority, just a very small minority. The push and promoting of men in skirts in the real world continues. The National Trust are embracing Diversity and Inclusion in a very big way with promotions and taking part in events. The National Trust are keen to cast a modern image and approach to its business style by getting out the message to the public at large that it does embrace and take on all from all forms of diversity and break the stereotypical image of elderly white women in tweed skirts. I was approached by my line manager if I would be interested in taking part in a National Trust filming for Diversity and Inclusion. This filming is to be used as training as well as promotional. I obviously said yes. This took place on the 1st June 2017 at Fountains Abbey with 7 from the North of England and the previous day filming down South had 5. Lots of stills and video was taken for various future tasks, one of which a two minute film was shown at the National Trust Convestival 2017. As with most filming exercises you are just untilised with directed input and no feed back of output. I would do it again if asked but reality is not as discussed and you do not really know what is going on with a plan of action. A link to the Confestival film on the National Trust Intranet has been sent to all participants. I have promoted men in skirts though in a big way, via a large organisation in a commercial and work environment. It didn't finish there. By pure fluke, I was at home on Friday 23rd March. It was a very wet day and very unusual for me at 9 am I went on Twitter. It was the week the Exeter School boys were going viral on social media in protest to school policy that boys were only allowed long trousers not shorts when girls could wear trousers or skirts. Being told no by their headteacher, 30 students went to school in school uniform skirts. Search the net, if you had not heard. I stayed away from reactions to their protest as they were only using skirts as a means to their ends but the discussion widened to men generally and male office workers and I did join in many tweets and other areas of debate in the run up to the 23rd June. On the morning of the 23rd it was still reverberating the internet with a tweet coming my way from BBC Radio York that at 9 they were to discuss this subject. I sent them a reply. I have done this to both National BBC and ITV on earlier discussions over them months and years and get zero response but not this time. Replying to tweets under my search men in skirts, man in a skirt, and checking replies I had posted on independent articles the two days prior, I did not realise that BBC Radio York had tweeted me back, sent an email via my web site asking for me to partake in the discussion, live on air. It was 10 am before I realised and the discussion time had gone but I called them and I was interviewed by the programmes researcher and at 11.40 I had a 10 minute slot talking about myself and men in skirts. There is an audio link to it on my web site or go direct by clicking here. Another opportunity taken to push men in skirts as being no different to women in trousers. Sadly it didn't go any further but the researcher thanked me afterwards and said I had certainly opened a few eyes to the subject and not just at the radio station. The show presenter sent me a Direct Message via Twitter thanking me and also said the experience had been very enlightening for many. My wife and I have been out and about a lot over these last 7 months. We still partake in two music societies, one winter, one summer, on a monthly basis, attending a third making it twice on many months. We have been to plays at theaters and to hear speakers like Sir Rannulph Fiennes and Drummers called Yamato Drummers. You would think 5 minutes of drumming and you've heard them. 2 hours later you wanted them to continue. Not had much opportunity for folk music but have booked 6 folk concerts for later in the year. Had 5 days down in York staying at a hotel in York and not a single pair of trousers were in my suitcase. Photos of me in York are on my web site. These like other day to day duties like food shopping etc are all skirted. We are still active in the walking club, where walks are not done in a skirt, but their social events are. Both my wife and I are well liked and encouraged. I do know there are a small minority who do not agree with the skirt wearing but the vast majority are not but the minority say nothing but the vast majority are encouraging and speak positively. We have started to walk with another walking club, and as far as I am aware they do not know. They will in due course but most of my walking, especially club walks I am always in trousers. I will promote men in skirts, talk about it, but I do it as and when not make an issue or force it onto the discussion platform unless it is the discussion. For me it is just part of everyday life just like women and their now preferred style of dress. Also, like most things in life that are different, let them get to know you first because humans have one big failing - judgmental. My wife and I alternate the two walking groups as they walk on the same days. The other club walks twice a week but that clashes with our National Trust volunteering. We walk adhoc with a few privately from the club we have been in for the last two years, and walk privately just the two of us as and when we can. We aim to be out at least twice a week but with two dogs our daily walking over two walk periods is between 3 and 8 miles. 8 miles takes us one and half hours. No stiles, gates etc. Good open countryside. We have walked in the Lakes a good 9 times this this year since April, North Pennines have been visited as well North York Moors and the Yorkshire Dales. We have this year got to know a couple, yes I was skirted when we first met, that has developed into a friendship and have had two walks with them. I have worn skirts walking just with myself and and Mary at least 4 times in the Lakes District and quite often from home, which does give us access to open and hilly countryside. There are two photos of me walking in a skirt this year on my web site. We have had meals out from time to time, pubs, restaurants. As my Doctor said to me last October when I queried the illness, the reply was "welcome to life's wrong end of the stick. You are beyond 50 and anything can happen to anyone. It is life style, fitness and attitude that helps recovery". We now put more emphasis on enjoyment than before but not forgetting you get out of life what you put into it, so it is and cannot be all enjoyment, but now we can choose the hassle, "politics", and the levels of it. Since my illness we have readjusted our life. We will walk away from anything that gives us hassle. We are retired, the 6 days garden is activity, pin money and being paid to go to the gym. We are not on a huge bucket list drive or expensive pursuits, we are happy with the life style of concerts, theatre, walking, volunteering and short breaks. We are giving that the priority, yes day to day jobs come in, but the DIY is now at a stage it is November to March based, when gardens close down and walking is curtailed due to short days and weather. But I still push men in skirts though. I left Twitter dormant for all of 2016 and early 2017 but started back on it over these last few months, as two keeping an eye on any blogs where responses are allowed. I tend not to register on many as they can be one offs, but some allow an open comment or via a generic login like Disqus. All I can say to any would be men in skirts, just go out and do it. I have recently had a few tweets from a man who wears kilts, but would like to wear skirts and dresses and hopes for the trouser tyranny to go. He has told me he will stick with kilts, that is a small step, skirts in public is one to big for him. Over these last few months my wife and I have seen a man in a tartan skirt on several occasions in a town not far from us. My wife says it is definitely not a kilt. However, when ever we see him it is never possible to make contact. We are in a moving car with the circumstances making no possibility to stop without causing a lot of horn blowing and irritated drivers. Perhaps one day I will be able to say "hi" from a fellow skirt wearing man. Sorry, no photos in this edition! This blog has a serious message for all those who turn a blind eye to a change in a persons medical persona for what ever reason. DON'T. Prompt action makes the job a whole lot easier. Yes at times it is still too late, nothing can be done or current deterioration can only be arrested but you do not know that and these days with medical knowledge and technology a lot can often be done if prompt early action taken. So do not bury your head in the sand, take action. I have always dreaded a spell in hospital as a patient. The thought of needles, operations etc was always a fear, yet in mid October 2016 when I was given a piece of out of the blue yet medically serious news I took it in my stride to my amazement. When I went back to my GP a few weeks later to thank him for his very observant diagnosis, even the hospital consultants remarked on his observation, he took my praise and compliments but said I am simply doing my job. He added many a time he has had to give a patient similar serious news and he either has to console them or pick them up off the floor. His "punch to the stomach", his words, when I was told he was amazed that I just sat there and said tell me what do we do from here, and what can you do as my doctor. Pre 2012 I doubt I would have taken the whole process as calmly as I did throughout. My strength of character, and determination to be me, an individual, to have a life as I need and see within the laws of society that I started to embrace from the day I drew the line in the sand back in 2012 and said no more, never again helped along with the strategies of coping with society, people and the world from my Counselling sessions. I was also skirted and in clothing as shown on my web site throughout except for when hospital gowns were needed! Currently in brief, on 9th December, 2016 I came home from 5 days in hospital having a section of bowel removed for Bowel Cancer. This is the last time I will use those words here, I do not have room in my life for negativity at all since 2012. On the 29th December I was told that I had the all clear, the section of Bowel removed and the lymph glands attached had not become cancerous. The end outcome is excellent. My commercial gardens duties and return to my serious DIY are on schedule for mid to late April 2017. I'll expand. I was basically fit and healthy or so I thought. Weight had not been lost, appetite as expected - the hollow legs appetite – and no other symptoms at all, including blood in the stools pain or discomfort. 2016 had been very busy for us both, so busy had no time away and walking confined to our walking group. Gardens booming and some going to weekly others needed hedges and climbers cutting not once, twice or thrice but often four times. Stress was added with putting air source heating in and as that had to be done by professionals and unusual for me, it gave me a series of deadlines to achieve other DIY work beforehand. It was done in two phases, early April and early November. A lot of this work was physical structural work involving steel beams and block and beam flooring so feeling fine, gardens, DIY and our walking of around 15 miles including hills what could be wrong! These activities continued right up to until 4th December as despite the next day operation I was fit, dare I say healthy and fine. think bladder infection. On Saturday 15th October I had just completed a 12 mile walk including two hills. That evening I developed indigestion and was very sick overnight. On Sunday 16th, indigestion still there and my urine turned bright orange. This was very unusual as I drink 5 to 6 pints, minimum, a day of water so it is normally very clear. The first week of the news I was all over the place, negativity to the fore after all apart from the diagnosis there was nothing else. How serious, terminal etc etc and of course having to let some know. We both decided the fewer who knew the better so it was only immediate family, not wider family, one very long standing friend not other friends. I certainly did not want fuss, over reaction and over the top pampering, after all I still felt as I always had done - well. I soon got back onto the positive stride. 48 hours of seeing the GP all tests he could do were back and all clear, even bladder infection but 24 hrs of seeing him even those symptoms had gone. That is the first bit of positive news and it was to continue as we progressed over the following 6 weeks. Four days after seeing the GP the hospital called and 3 days later I had my pre Colonoscopy chat. I absolutely dreaded this and in the hospital became quite worked up. My dreaded fear was now a reality. The nurse was absolutely wonderful in manner and approach as to the staff of the Endoscopy Ward the following week. All very good at reassuring and making you feel at ease without patronising or pampering. It was amazing what we talked about. Preparation took about an hour, forms, serious information and waiting my turn but the friendly non-business banter certainly helps and I noted from others on the waiting ward it did depend upon the patient as to how the nurses interacted with you. The Colonoscopy confirmed a large Polyp, which filed the bowel and that was removed there and then. The largest the senior consultant had seen and took three separate cuts to remove. I basically had 4 Colonoscopies in 1 hour! My GP on referral had insisted that all work on me had to be done by very senior personnel and this particular person was the most senior and extensive experience in this particular NHS Trust for this area. Every one I saw from there on were heads of Departments. This Colonoscopy indicated that everything else was pink, fit and healthy and the camera went right to the stomach exit. To quote this chap, your Bowel basically is in very good shape for your age, shame about the Polyp. The Polyp was confirmed as being malignant and days later I had had a CT scan which was confirmed days later as being clear, completely i.e. there had been no spread. Things moved fast, very fast, we were at the hospital every week, mostly twice a week. I went back shortly later for another colonoscopy by the senior surgeon so he could look and assess. The polyp size, the size, the lack of symptoms, I was asked repeatedly about this, bothered them. Surely it must have spread. The second colonoscopy indicated all was still fine and yes the large Polyp had been fully removed. Due to its size, and after the third cut to remove it, the area became blurred and 100% clarification could not be seen. I watched both Colonoscopy on full HD screens, fascinating is an understatement. The original Polyp had been 100% removed, no trace left visually and to the surgeons surprise he was amazed as to how well the wound had ulcerated over, the internal scabbing, in such a short period of time. it was 100% white. Biopsies around this wound area were taken and all came back clear. This was only around the area, not actually on the area. This left the hospital with yet more dilemmas as the size of the Polyp and cancerous to its stalk for them should not be consistently returning clear results on whatever they did especially as it was malignant but then why not. They apparently held a high level brainstorming session purely upon me. I was recalled, and basically told everything confirms clear but if one cell is left on the healing wound area it will grow and go directly into the Lymph Glands. I will be monitored on the 5 year NHS plan and then react if need be. Alternate they are prepared to offer me the Bowel operation and cut out the wound area and attached Lymph Glands and again be on the NHS 5 yr monitor programme. The first option leaves doubt the second leaves no doubt. The second option would not involve Chemotherapy or a stoma bag. My reply was instant, the operation. This would allow positive confirmation as to if it had started to go into the bowel wall. CT scans and blood tests only show if spread and size not if it is starting to go from Polyp into Bowel wall. I could opt to see if tests and scans detect something later but if it does I would be on a much larger battle than now so it was no decision for us. A week and a half later that is what happened on the 5th December. The surgeon and many others at the hospital have said after the event it was a very wise choice to make despite the temporary inconvenience I will endure these next 4 months. During this period mine and my wifes life continued in our positive way, we socialised, got the gardens completed and tended to some DIY jobs I needed to deal with before I was placed on my post recovery operation. Still only the select few knew. Locally no one was told as we did not want gossip and scare mongering going out as tends to happen with local chatter anywhere. On our roller coaster ride things were changing rapidly, so telling those locally who needed to know and associated themselves with us would have been continually updated. For the next 6 weeks following 5th December I must take life very easy. Active, move but no physical exertion, lifting, pushing etc. The keyhole surgery takes 6 weeks to recover. Internal keyhole surgery is the same as standard surgery and for an unfit person up to a year. 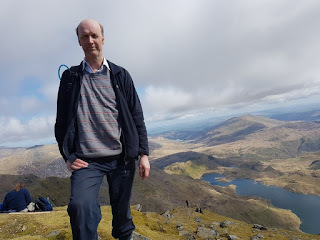 I have been told that if I extend these 6 weeks to mid April, basically increase my exercise and activity but refrain from any hill distance walking and my DIY, and you will know from these blogs my DIY is akin to professional builders, then I will be completely ready to undertake all my duties but with thought. All my DIY tools were put away,all materials obtained ahead of this winter period relocated elsewhere in the house so we can look at a house not a prospective building supplier. not experienced that so soon before. I was demanding energy on the day after the operation even though I could not start liquidised food until 48 hours after the operation which gave them a quandary as bowel movement had to be zero for two days. I got none and was I hungry! On the 7th December I was put on "slops" and responded well and on Thursday 8th December a full and normal diet but eating much smaller portions on a more regular cycle. The keyhole wounds were healing. By 25th December I was wanting my usual full size portions. One of the Nurses on the ward for my last two days had a very heavy cold, sneezing and blowing of nose. For 7 years I had avoided colds via diet and herbal remedies. Sunday 11th at home I started the early signs of a cold and Monday 12th I had a real stinker with a cough. Coughing after bowel surgery is not good. They advise occasional induced coughs but sneezing and coughing regularly not only hurt but kept two of the larger keyhole wounds weeping. I had to have them dressed at the local GP two or three times that week. I got up each day by 8 am, stayed up, and kept myself occupied. By Friday 16th the cold had significantly gone, dosed with the commercial cold tablets and my herbal remedy but in the afternoon of the 16th I felt very strange and cold. By 6 pm that evening I felt as though my body was shutting down, I shivered, felt cold but told I was warm to touch but I was rapidly losing control. I hit the bed and a fever broke out. My wife checked on me periodically and was not concerned enough for medical response but I apparently had a strange conversation with her. The bed was wet with sweat yet I felt cold. This continued through the night, the bed needing changing in the morning and I had no energy or enthusiasm to get up and stayed there until the evening although not not perfect I needed to get up so I did and the next day, Sunday, felt washed out. I went to the GP sit and wait surgery only to be told a fever based virus is circulating and once you have had the fever it is past. The rest of the week I just made steady progress, coughing stopped and the two wounds healed like the three smaller ones. Christmas Day I finally felt on top of the world. The weekend of coming out of Hospital, 13th/14th December, those who didn't know and needed to know were told either by email, phone or in person and many came to see. The week up to Christmas and the week after was very full with visitors and many emails and phone calls. Although eased off now for obvious reason I still get weekly calls or emails asking after progress, but an ailment was still to come. By 30th December my stools were back to normal and once a day but the body clock still not set, so the once a day time varied. On 31st I stopped going as too the 1st December. I increased the laxative tablets, took dried apricots, rhubarb etc but no movement. On 3rd January I called the Consultant whose assistant said if I was in pain, which I wasn't come now, if not come tomorrow. I went the next day. They felt it was constipation this can happen but also needed to eliminate any possible surgery side effects like small intestine joining the main bowel wall etc. Prodded and poked, fingers up the back end, X-rays and all was confirmed to be perfect and in good order so constipation it was. They issued me with an alternate laxative which will effeminately clear the bowel. It did. The next 24 hours I went 14 times all with generous downloads. Things are moving now! Apparently it can take a bowel several months to settle down and become regular so I have extra sachets of this laxative to take if no movement in the near future after 2 days. Lets hope that is the last glitch. Major operations take it out of the body. I am very fit, healthy asnd exactly correct for weight to height ratio. All my activities in life are physical but It still knocked the stuffing out of me. Where I was to gain was with the recovery so the heavy cold, fever and a week of constipation did not help. I can pick light things off the floor and do light duties around the house. Can get out of chairs with no sensation and on 7th January did a 1 mile round trip of tarmac road walk. I certainly feel much stronger physically but still noting I have until the 21st January before the 6 week recuperation period is over. After 21st I will still avoid all DIY and fell walking but start to increase activity and distance over the next 4 months. These last few weeks for a very active person is now becoming frustrating and I am very mindful that I am prone to Depression. I have learnt the signs and strategies but the life style at the moment is not really helping and because I am not over active and feeling tired, negativity that the world still needs to have can become a little harder to ignore even fight off. After a while, or in this case, 4 weeks of light duties which at the start were out of bounds, reading, watching television, very short walks and often confined to the house to walk around if weather bad can become too much for someone who is usual out and about, active and getting involved. Week commencing 9th January I have our self assessment forms to do for tax purposes and next week have my first of two meetings in January with regards my National Trust volunteering role as Day Leader. Both our volunteering for 2017 starts in Mid February. At the end of January I have our walking club committee meeting. The fact I can start more activities around this time the up hill climb seems much brighter and easier. In the UK the NHS gets a lot of bad publicity in the media. At the end of the day media anywhere like bad news and only sensational good news. We have met many who compliment the NHS and 3 years ago my wife needed attention via the NHS thankfully not for operations but still what we encountered was good. We say the same for my recent experience. They were fast, prompt, attentive and showed nothing else than I was a human being not a number or just a body. For us we felt that they did a job but went beyond that job. Also throughout this process I went at all times in the outfits as shown on my website www.theskirtedman.eu. all meetings, tests, pre op talks, even the day of surgery and departure. I'm sure one or two will have negative thoughts but many were complimentary and talkative about it in a positive way. I know NHS policies will forbid any showing openly any negativity but honestly all were very positive and embracing especially those I had direct contact with with regards procedures and preparing for the procedures. I am only aware of five who showed negative indications and these five only had adhoc and mostly once only contact and not that I could mention directly officially. One of the five that did go that bit further it was in a room with me and her so again I ignored it but all five were civil and communicative. The next blog will be a bit shorter as activities for this skirted man will be low key for the next few months.